Palm Springs: the land of Mid-Century modern, old Hollywood stars and endless summer. This is a special destination guide because Palm Springs is also my home! I’ll be honest, before I landed my former job as an anchor/reporter at the local TV station in the desert, I’d really never heard of Palm Springs. I think I was living under a rock in the Mid-West but this town has quickly become a huge part of my life. I love the beauty, the cocktail culture, the history and the renaissance the town is experiencing right now. I could go on for days, but to keep this focused I’m going to share my five favorite things to do in Palm Springs along with my usual guide to getting here and making the most of your trip. History: It’s refreshing to find a place that manages to honor its past while still being able to see into its future. Damn, that sounded like a famous quote…Nope just wrote that bad boy myself. Anywho, Palm Springs is ALL ABOUT celebrating its history. From the city’s first pioneers, the Agua Caliente Band of Cahuilla Indians, to the Hollywood celebrities who called this town their playground, Palm Springs continues to remember its roots. I won’t go too in depth but one of the main draws back in the day was how close Palm Springs is to Hollywood. The stars could come out to get away from the crazy grind of LA and not be bothered. Many people can’t think of Palm Springs without thinking of Frank Sinatra and Bob Hope. The tradition lives on with celebrities like Leonardo DiCaprio owning homes in the city. It’s not hard to see why the who’s who of Hollywood loves Palm Springs. Getting There: Here’s the best thing about our little town, WE HAVE AN AIRPORT. Seriously, it’s the best. Palm Springs International Airport is small and it’s so easy to fly in and out of. I love it. I refuse to fly out of anywhere else because it’s so easy and there’s rarely any delays. During season there’s direct flights from Chicago and New York which makes me really happy when I go home to see the rents. Stay: Since I live here I’ve had very little need to stay at hotels. However, my former job allowed me a glimpse into some of the best hotels out here and I gotta say, there’s a lot. Parker Palm Springs: This will, without a doubt, always be my favorite hotel in the entire world. And that’s really saying a lot. The service is top notch and this is the hotel where stars like Beyonce, Tom Hanks, and the Kardashians stay when there in town. So if it’s good for them, it’s good for me. Arrive: This is one of the newer hotels in Palm Springs and it’s on the far north side of town. Arrive is known for its unique atmosphere and laid back vibes. Ice Cream & Shoppe and Customs Coffee are attached to the hotel along with their yummy restaurant Reservoir. Heads up, Arrive is adults only. Which in my opinion, sorry kids, is a plus lol. La Serena Villas: Another new property in town. This one is located right in the heart of downtown and is a smaller boutique hotel, only 19 rooms. This is also adults only. I love their restaurant Azucar and the décor is impeccable throughout the hotel. The Kimpton: You can’t miss this giant. It’s the tallest building in Palm Springs. It opened in 2017 and it’s a larger scale hotel. But that doesn’t mean its impersonal. The hotel is known for offering nightly wine hours for its guests. The hotel has an awesome rooftop bar and pool and their restaurant 4 Saints is super yummy. Wow there’s so much. Here’s my short list. This doesn’t include my top five favorite things because being redundant is annoying. Hike the Indian Canyons: I love, love, love this part of Palm Springs. It’s the city’s own little oasis. And really it is because there’s natural waterfalls on the trails. It’s such a peaceful place and there are a variety of hikes you can do for all skill levels. Take a historical walking tour with the Palm Springs Historical Society: I always think it’s important to learn a bit about a city’s past. And Palm Springs isn’t short on history. There’s a number of different tours you can take. Including one that takes you past all the old Hollywood celebrity’s homes! Visit Trina Turk: You can’t go to Palm Springs without stopping by Trina Turk. Her designs are perfectly Palm Springs and the bright colors will light up any room. Stop in to the many boutiques along Palm Canyon. Especially Christopher Kennedy’s store and tell him I say hi! Shopping is a must and there’s so many good stores to pop into. Christopher Kennedy is a well-known designer out here who famously transforms one home each year for Modernism Week. He’s a doll and his shop is so cute! Great for souvenirs! Visit the Palm Springs Art Museum: Palm Springs is all about culture and where better to get your daily dose than at the art museum? It’s great to spend a morning perusing the works and then have some lunch at their newly renovated restaurant Persimmon Bistro! Gosh, where to even begin. During my time here I feel as if I’ve eaten my way through the Coachella Valley. There’s so many delicious places to eat, it’s so hard to narrow it down. Here’s a few of my absolute favorites! Counter Reformation: This place. Honestly, all of the restaurants at Parker Palm Springs are phenomenal. This is my favorite because it’s all about small bites. Chef Herve Glin knocks it out of the park nightly and the food is sinfully good. Which is why the small restaurant has its very own confessional for you to get some things off your chest, if you need to. Order the Avocado Tartine and the Cheese Board. Farm: I can’t say enough about this hidden gem. It’s located literally right in the center of town but once you walk into the courtyard you immediately feel like you’re in the French countryside. Unless you dine there in the summer, then you know you’re in Palm Springs lol. The ambiance is what makes this place amazing. The food is what takes it over the top. Order the Bloody Mary and the mushroom crepe. Evzin: If Mediterranean food is your thing, this spot will be your new favorite restaurant. The owners hail from Greece and once you’re inside you can see touches of their culture woven into the design of the restaurant. There’s this beautiful black and white mural right when you walk in that the owner’s wife hand painted. It’s pretty impressive. The food is just as spectacular. I always go for the falafel. Kreem: If you have a sweet tooth or love coffee, this is your spot. Kreem is all about organic and homemade ice cream and man is it delicious. They even have vegan options if that’s your thing. Their ice cream sandwich is made with homemade cookies and it’s so decedent! Azucar: Whether it’s lunch or dinner this place is on point. It’s the restaurant inside La Serena Villas and the décor is every girl’s dream. Amazing black and white tiled floors and a wall dedicated to Frida Kahlo. How cool is that? Make sure to order their blood orange margarita and the cauliflower risotto. Raw Remedy: Into eating artfully crafted acai bowls?! Even if you didn’t know that was your thing, I promise after eating one of these it will be. Raw Remedy is the go to place for healthy drinks, lunch and sweets. I mean look at these master pieces. Perfect on any hot day! 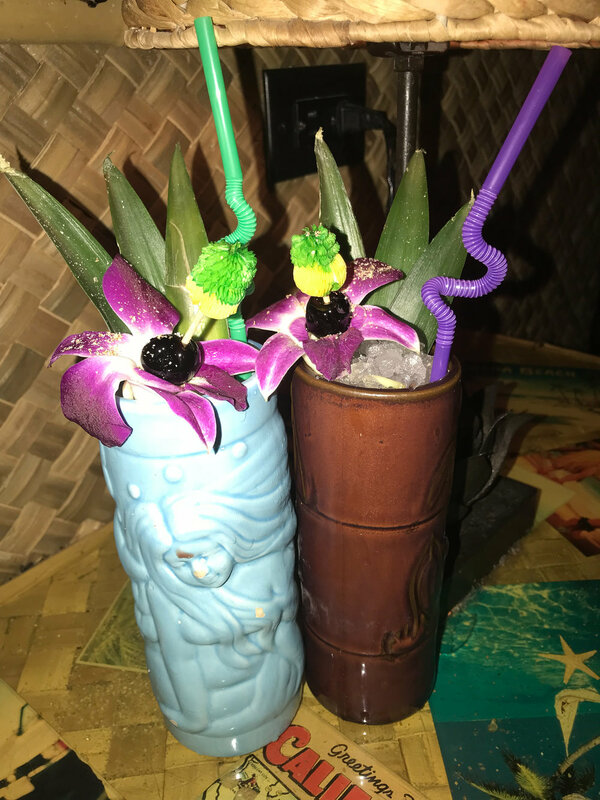 Bootlegger Tiki: If you don’t enjoy a fun fruity cocktail served in a crazy tiki glass than I really don’t think we can be friends. Lol but for real, this spot is a must if you’re visiting Palm Springs. The bartenders are experts at creating custom cocktails to your liking. You tell them a liquor and your flavor profile and they’ll make something delicious. Heads up, it’s a tiny spot. Get their early if you can, so you can secure a spot to sit. Truss and Twine: This cocktail bar is the perfect spot to meet friends and snack on some nosh. The cocktail menu sections off its drinks based on era. It’s also open pretty late which can’t be said about all Palm Springs spots. The Draughtsman: If you’re into craft beer and corn hole this is your spot. The Draughtsman is a great spot to hang with a big group of friends. It’s about as “sports barey” as Palm Springs gets, which isn’t that sportsy. They also serve yummy food that’s a mix of comfort and pub classics. The Bar at 4 Saints: Views for days up here. The bar inside 4 Saints in the Kimpton is classy and minimalistic. They’ve got a great cocktail list and a phenomenal wine selection. Pics or it didn’t happen right? Here’s some of my go to spots for Instagram photos. I hope you fall in love with this town and see just how special it is.